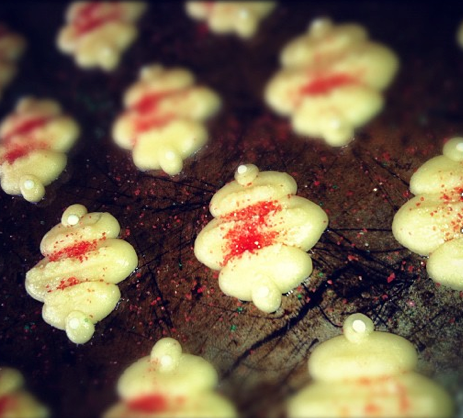 These are a family favorite, and the perfect recipe to use with your cookie press. Their small size makes them easy to eat without feeling too guilty, and the simple recipe makes them great to give as gifts. They are a Christmas favorite in our house, a recipe passed down from “Grama B,” so I thought it was a good time to share. Hope you get a chance to try them out, they really are delicious! Cream margarine and sugar. Add other ingredients gradually one at a time. Put in cookie press and place cookies 2 inches apart on a greased cookie sheet. Add decorations if desired, the crystal sprinkles work the best. Bake at 325 degrees for 8-10 minutes. The cookies are done when the edges are golden brown. Enjoy! This entry was posted in Foodie Fridays and tagged baking, Christmas, Christmas cookies, Cookie press, cookie recipe, cooking, dessert, family, Spritz Cookies. Bookmark the permalink.